Say you're my everything and I plan to keep you around a while with these delicious and healthy oatmeal cookies! Loaded with cherries, almonds and dark chocolate, they'll devour every morsel of these thick, chewy and crunchy delights! Surprise them with a couple for breakfast in bed on Valentine's...they'll feel so pampered! Better Than a Five-Star Hotel! Line a couple of cookie sheets with parchment paper. Beat the sugars and butter well and scrape the bowl. Add the water, egg and vanilla and mix well; scrape the bowl again. In a separate bowl, using a whisk or fork, combine well the oats, flour, baking soda, salt and spices. Add the almonds, cherries and 1 c. of the chocolate morsels to the dry mixture and stir well with a wooden spoon or spatula. Incorporate well the dry mixture with the fruit, nuts and chocolate into the wet mixture...you can use your electric mixer on a low speed. Using an ice cream scoop, drop the batter onto the parchment-lined cookie sheets, about two inches apart each scoop. Bake approximately 16-18 minutes or until light-golden brown. Let stand on the pans about one minute. Carefully slide the whole sheets of parchment paper with the cookies onto racks to cool. Once cooled, carefully place the paper with the cookies back onto the cookie sheets. Melt the remaining chocolate morsels in a microwave-safe bowl for about 45 seconds on medium-high (70%) power. Stir well. If not completely melted, return the chocolate to the microwave for another 10 to 15 seconds and stir well again. Working quickly, use a whisk to drizzle the melted chocolate onto the cookies. To set the chocolate, freeze the cookies on the cookie sheets for about 15 minutes or refrigerate them for about 30-45 minutes. Store in an air-tight container. 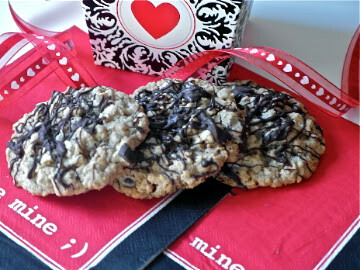 Share your love on Valentine's with these scrumptious cookies, and you'll get lots of hugs and kisses for sure! Enjoy! Now, this is the perfect thing to give to your special Valentine!!! Thanks Betty! I'm so glad you agree...it's heart warming! I have almost the same cookie due to post tomorrow! So I know these are terrific!!! Hey Lizzy! I've had this happen to me also a couple of times...looks like we enjoy the same things! I'll look for your post! As we say in the South Lizzy, you're "just a mess"! I'll bet they do taste good frozen..I've had some cookies (and cakes) I like frozen! Maybe try hiding them under something that's hard to get to in the freezer...oh heck, there's no getting away from them...they'll just haunt you! 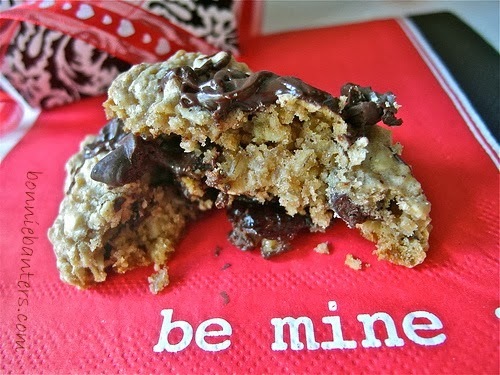 What a yummy treat for Valentine's Day or any day! These have so many delicious ingredients! Beautiful Bonnie! Hey Jill...Thanks so much. Hope your Valentine's Day was real sweet! Holy loaded oatmeal cookies, Batman! Those look amazing, and since I have some dried cherries on hand, you 'know' I'm making these! Lisa, I love your comment...I actually laughed out loud! Having everything but the cherries (added those especially for Valentine's) on hand led to this recipe...Enjoy! Thanks! Hi Bonnie! Wow! We are both on a chewy cookie frame of mind. I'm sorry I've been a bit absent...we've been traveling to and from Houston, and I've gotten behind in my reading. Thank you for sharing with me...as always, delicious! Hi Monet! I'm also behind on my reading. I need to check your latest post out. Thanks for taking a minute to stop by...good to hear from you!